A LITTLE Irish boy has penned a note to Iarnród Éireann begging the company to continue running the Sligo to Dublin service, which is regularly used by his sick mother. Six-year-old Darragh Wash from Sligo was reacting to a report in his local paper, the Sligo Champion, on the potential closure of Irish Rail’s Sligo to Dublin route. The news upset Darragh as his mother regularly uses the service to travel to the capital. 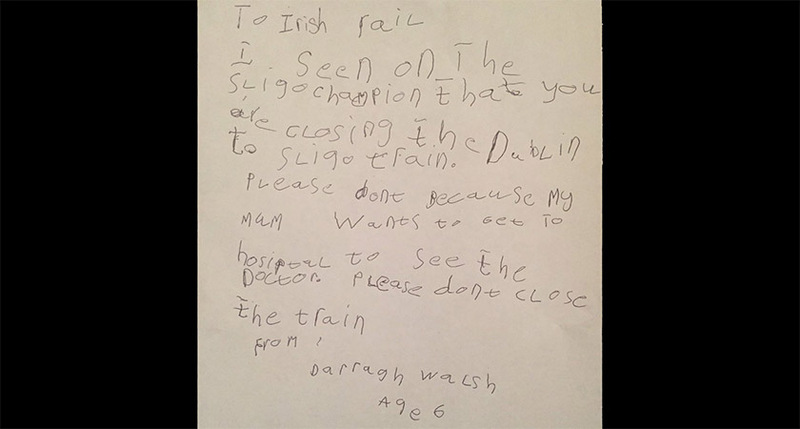 “To Irish rail, I seen on the Sligo Champion that you are closing the Dublin-to-Sligo train,” little Darragh wrote in the letter – shared by a family member to Twitter. Speaking to the Sligo Champion, an Irish Rail Spokesperson praised Darragh for his concern over the route’s future. “Darragh’s letter was a timely reminder that behind discussions, about funding the future of rail transport and infrastructure are very human stories and realities,” they said. “Lots of people, including Darragh’s mother, rely on our services for essential travel, including hospital appointments. “It was clear, from Darragh’s letter, that he is caring for, and looking after, his mother while her hospital visits continue. To thank Darragh for his letter, Irish offered him and his mum a free train journey.